There are mornings lately, glancing at my Twitter feed, when it feels like the whole world is conspiring to publicize The Good Wife. If you haven’t been watching the CBS series (and you should be, because it’s excellent), it’s a legal procedural about a political spouse, Alicia Florrick, who returns to work when her former-state’s-attorney husband goes to prison after a prostitution and corruption scandal—a woman a lot like former lawyer Silda Spitzer, whose crushed expression hardened into iconography back in 2008. Over the show’s two seasons, the protagonist (played by Julianna Margulies) has become something of an icon herself, a fictional figure who allows us to inhabit the inner lives of all those women who’ve done the marital perp walk these past decades: Hillary Clinton, Princess Diana, Donna Hanover, Elizabeth Edwards, Jenny Sanford, Dina McGreevey, Elin Nordegren—and in more recent weeks, two former TV pundits who gave up their high-­profile jobs to support their husband’s political careers, Maria Shriver and Anne Sinclair. It’s tempting to apply that calculus to every public marriage. What if Hillary Clinton hadn’t aced that 60 Minutes interview, the one where she argued that her marriage was not an arrangement but a study in maturity, of staying power? What if Obama hadn’t been paired with Michelle, who provided an alternative image to that election cycle’s two female candidates and whose marriage, with its presumed monogamy, its playful egalitarianism, fed the fantasy of hope and change? Then there’s the fraught question of blame. 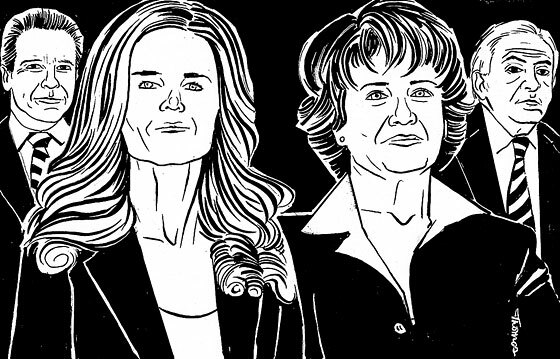 How should we view Elizabeth Edwards’s legacy, knowing she urged her husband to run even after she knew about the affair, or Maria Shriver, who lobbied for her husband after the L.A. Times exposed his alleged history of harassment? The first-spouse role is presumed to be a vestigial organ, leftover from the days before feminism. It’s a passive position: the woman behind the man. But the reality, of course, is that it can be far more active, and scandals have an unnerving way of bringing that to the fore. On her popular French political blog, Anne Sinclair has left a note explaining that she’d be unable to post for a while. She used to conduct TV interviews with everyone from Gorbachev to Madonna, but it’s unlikely anyone will get such a sit-down with her—or, if they do, that we’ll learn much. So we are left to observe the closed shades of Dominique Strauss-Kahn’s luxe townhouse rental and wonder about his wife and her choices, and perhaps to think to ourselves: What would Alicia Florrick do?